Free Printable Sports Crossword Puzzle. 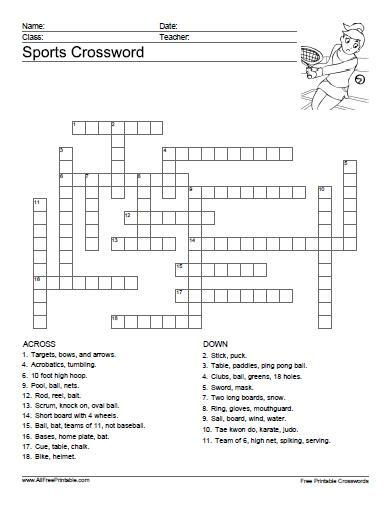 Print Free Sports Crossword Puzzle, a fun game activity for kids. Free sports crossword game that teachers can use at the classroom to teach kids about sports. Print it free using your inkjet or laser printer and let the students have fun searching 20 of some well known sports. Find sports like Wind Surfing, Water Polo, Cycling, Golf, Skiing, Volleyball, Table Tennis, Baseball, Rugby, Hockey, Basketball, Rugby, Gymnastics and many more. Click the link below to download or print the Sports Crossword Puzzle Game now in PDF format.